When I was looking through Marguerite Patten‘s recipe book We’ll Eat Again yesterday for sandwich fillings, I noted a recipe for Potato Rarebit. 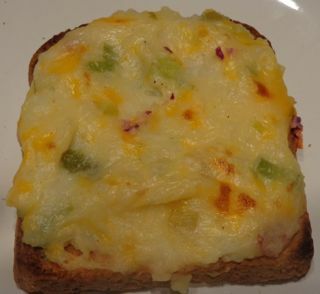 Potato Rarebit. Recipe from We’ll Eat Again by Marguerite Patten. I had some mashed potatoes (with chopped bacon and leek) left over from a couple of days ago, so I thought I’d give it a try. Surprisingly, it was very good, and with some homemade coleslaw on the side, very filling. Stewed Sausages with carrots and leek. For dinner tonight, I had a favourite from when I was growing up – stewed sausages – accompanied by the rest of the leftover mashed potatoes and brussels sprouts. It’s a really easy meal to make. 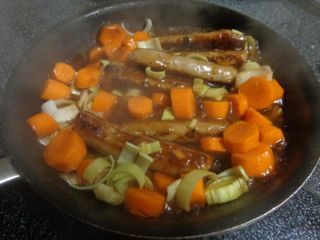 Fry the sausages in a little fat, add leeks and carrots, add some stock (or cider if you’d prefer), cover and simmer until veggies are cooked. Canadian Veterans were being offered post-war opportunities either in vocational training or educational opportunities. Fees would be paid, and $60 per month given to a single man/woman, or $80 per month to a man with a wife. Additional allowances were available if the couple had children. The programme was available for ‘period of service to a maximum of one year – but can be extended’. Disabled vets received special consideration, their right to training being ‘continuous’. In New York on Saturday night, Frank Sinatra was hit by an egg as he sang ‘I Don’t Know Why‘ at the Paramount Theatre. According to Gallup, with the US Presidential election only 3 weeks ago, Roosevelt had 51% of the poll while Dewey had 49% – with an error of 3-4%. The Personal section was fascinating, operating as a kind of 40s Facebook, with notification of various members of the public returning home from holiday or weekends in Camrose, Banff and Brooks, and of members of the forces coming home on leave. For example: Miss Lucille Allen left this morning for Denver, Colorado, to visit her parents. An eyewitness account of the gassing and cremation of 4,000 Jewish children in the German concentration camp at Birkenau was given today in a London dispatch. It quoted the letter of a Polish woman imprisoned in the camp for 7 months who was later transferred to a Warsaw prison from which the letter was smuggled out.